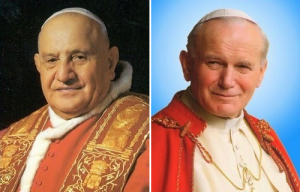 This Sunday, Pope Francis will proclaim Blessed John XXIII and Blessed John Paul II Saints. He personally chose the date to coincide with Divine Mercy Sunday, a feast inaugurated by John Paul II in 2000. It was on the eve of this feast on April 2, 2005 that John Paul II gave up his spirit to the Father of mercy. There is no coincidence in Pope Francis’ decision to canonize his predecessors on the same day. He has spent the better part of his first year as the 266th successor of Saint Peter sharing a message common to John XXIII and John Paul II: the need for evangelization and proclaiming the gospel of mercy. Their voices, witness and virtuous lives are center stage once again and resound those truths the world still yearns to hear. Although there are certainly differences between the two pontiffs, Pope Francis focuses on their complimentary contributions to the proclamation of the Gospel in the modern age. The Holy Father understood that the “New Evangelization” would not be accomplished by rejecting Church teaching but by strict adherence to the truth and through personal conversion. He wanted the treasures of the Church to be openly shared in the “modern world,” not ignored or coerced. He desired the eternal teachings of Christ to be presented to a world searching for truth — for the purpose and meaning of life. Pope John Paul II, the great defender of human dignity and voice of the voiceless — who personally experienced the horrors of totalitarian systems that devalued the dignity of human life — often spoke of the need to experience the mercy of God revealed in Jesus Christ in order to heal the world’s wounds. The experience of people in so many nations throughout history is a world stained with blood caused by hatred, violence and the reckless destruction of human life. This cycle of depersonalization and violence, he believed, could only be broken by the miraculous gift of forgiveness fully expressed in the life, death and resurrection of Jesus. In his second encyclical, Dives in Misericordia (Rich in Mercy), John Paul II describes the mercy of God as the presence of a love which is greater than any evil, greater than any sin and greater than death. He calls upon the Church to devote itself to pleading for God’s mercy for the whole world. Let us thank the Lord for His love, which is stronger than death and sin. It is revealed and put into practice as mercy in our daily lives, and prompts every person in turn to have ‘mercy’ towards the Crucified One. Is not loving God and loving one’s neighbor and even one’s ‘enemies,’ after Jesus’ example, the program of life of every baptized person and of the whole Church? While preparing for the canonizations of John XXIII and John Paul II, let us consider the challenges we face as we build a Culture of Life. Firstly, there remains much ignorance and confusion about the teaching of the Church concerning her dogmas and doctrines — especially the moral and social doctrines. Secondly, there is a disconnection between living out the requirements of faith and daily life. Gospel values are openly rejected as foundational for a healthy society and culture. No longer is faith the starting point for reflection, understanding and decision, but secular values and definitions. Furthermore, the value and dignity of human life and the natural family are continually threatened by a secular culture determined to redefine morality by upholding personal pleasure above all else — maybe the most dangerous challenge we confront. To combat the challenges of secularism and religious illiteracy, we need credible Christian witnesses, disciples whose lives are given completely over to God in a relationship that nothing can unravel. As we celebrate the holy lives and heroic witness of John XXIII and John Paul II, let us invoke their heavenly intercession on behalf of the Church. May the “New Evangelization” and “Spring Time” hoped for become a reality.